Did Key Kowtow to Beijing Butchers Over Dalai Lama? I vowed never to vote for Prime Minister John Key again, after he ignored a referendum which overwhelmingly demanded the re-legalizing of smacking in new Zealand. If this report is accurate (and I suspect it is) I feel vindicated. Key is a nice bloke, but not one to stand on the courage of his convictions - I don't believe he actually has any. 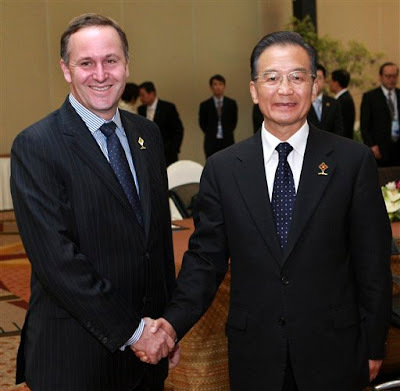 Prime Minister John Key assured Chinese premier Wen Jiabao no ministers would meet the Dalai Lama - despite a pre-election commitment to hold a meeting with the exiled Tibetan spiritual leader, cables between Wellington and Washington show. The cables from the United States embassy in Wellington reveal that in April last year, Mr Key told the Chinese premier neither he nor his Cabinet would meet the Dalai Lama when he visited New Zealand last December, the Herald on Sunday reported. That was despite give a pre-election commitment to Friends of Tibet chairman Thuten Kesan that he would meet the exiled leader, and despite Foreign Affairs Minister Murray McCully telling Parliament there was no boycott. However, a cable from Wellington to Washington quoted Ministry of Foreign Affairs diplomat Grahame Morton as saying: "PM Key had earlier conversed with Premier Wen Jiabao concerning the Dalai Lama's December 4-7 visit to Auckland, saying that neither he nor any of his ministers would meet with the Dalai Lama. "Morton said the Chinese 'obviously registered' this. Morton added that the PM ... made this decision without any consultation, but others in the Government are still obliged to respect it." Labour leader Phil Goff told the newspaper he knew Mr Morton and the cable would be a "reliable briefing - and it demonstrates the Key government has not been honest with New Zealanders". Key is out of the country but McCully rejected "any assertion of a deal being done" over the Dalai Lama. "That decision was made by the prime minister in consultation with relevant ministers. Representatives of the Chinese Government were informed of that decision in due course," he said. Imagine if Key had told the Chinese thugs to "piss off" and to keep their bloody little claws off New Zealand's affairs. Now there would be a man worth respecting. 200 mill for Crafars old farms is not that much ,but sold to China is national suicide.